Intelligent Generation (IG) is a technology company that offers a software solution to delivering a new economic paradigm by managing the flow of electricity between solar panels, energy load (e.g. buildings), a battery and the grid to optimize the value of solar energy. 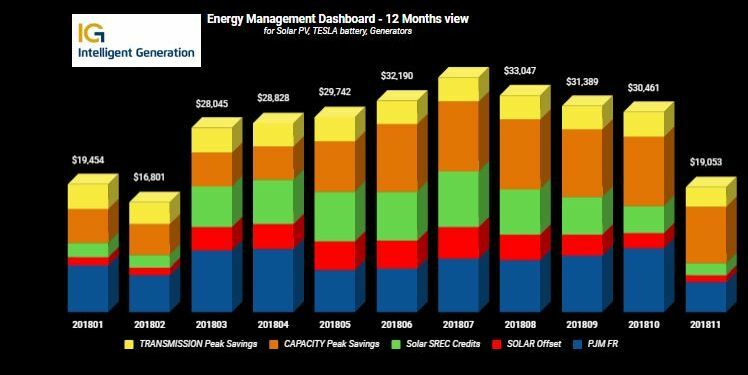 IG has developed a software application and service that elevates solar systems’ performance and economics when associated with an energy storage system. The cloud-based system monitors weather patterns, historical and real time load demands, energy markets, solar energy production and battery storage levels to reduce costs by using stored energy when regional power demands and pricing is high, as well as to generate attractive revenues by deploying the assets into the wholesale power markets. Greenleaf Advisors used its insights and relationships to connect IG with partners that helped develop and test its technology. We supported its capital raise and also provided access to and led engagements with marketing channels and building portfolio owners/operators. IG is now successfully commercializing their software services in the PJM energy markets and entering into strategic partnerships with industry leaders to position itself for a national scale marketing and commercialization program. Greenleaf Advisors was able to understand the value of a distributed energy solution associated with a network of energy storage assets, as well as the intellectual property and operational advantages behind IG’s technical software offering. Greenleaf Advisors has access to relationships with the interest and aptitude to assist IG in furthering its technology development, as well as relationships with developers, owners and managers of real estate portfolios where it can be applied, including industrial, commercial, residential, and institutional. Similar market applications for the software service are available in the electric vehicle market which Greenleaf has introduced to the company and which is under development. See IG's case study and value stack (PDF).